Finding a good hydrating product for my hands is my biggest issue when it comes to beauty. A lot of hand related products leave my hands with residue and just general greasiness. 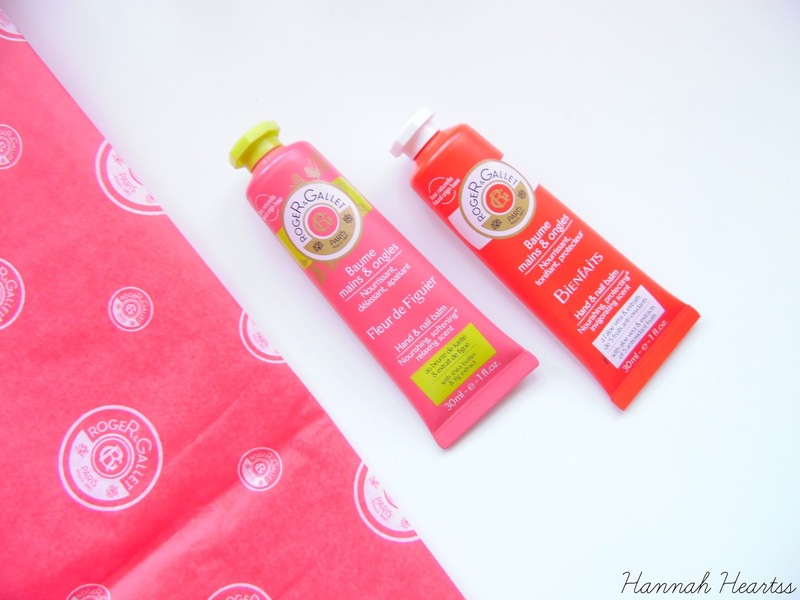 So when I heard about these new Roger and Gallet Hand Balms* I was so excited! I was lucky enough to receive the Fleur de Figuier and Bienfaits, both of which smell incredible! When I opened the parcel it smelt incredible and I just had to find out what the scent is and it was the Fleur de Figieur Eau Friache which I know I am going to need to get my hands on because it smelt so good. The Bienfaits scent is a refreshing blood orange which I have smelt nothing like before and I have really fallen in love with and to me feels expensive. The Fleur de Figieur Hand Balm I knew I was going to fall in love with because I have had other products of the relaxing same scent and it is my favourite smell. I am terrible at describing scents so I would suggest giving these a sniff, I know you are going to fall in love with these scents as much as I have. These hand balms are unlike anything I have ever tried which is what made me so excited about them. They have a matte texture from the second you apply them but are still rich in hydration for your hands. Each of the hand balms have no colourants, paragons or silicones. These are suitable for anyone with normal to very dry skin on their hands. 98% of the ingredients are naturally derived. They are also dermatologically tested. They come in a very handbag friendly size at 30ml and what I really like about the packaging is that it isn't metal like many hand balms which I love. The Fleur de Figieur hand balm is enriched with shea butter, aloe vera and fig extract while the Beinfaits hand balm is still enriched with shea butter and aloe vera. It is also enriched with the extracts of five different antioxidant fruits. The scent from both of the hand balms really lingers on the skin for an hour or so and I could smell it, even when I wasn't directly sniffing my hands, which I really loved and it made me apply it most often for the boost of fragrance. I only use a tiny amount for both of my hands, a little goes a long way with these, and my hands were left with a beautiful matte finish with no greasiness or residue! Since I have been using these multiple times a day my hands look so much more hydrated and plump which I never expected. My hands actually look so much younger than what they did before. I am not very good at looking after my hands which resulted in them being very uncomfortable and now they feel a million times better. I can't believe these only retail for £6 each because I would happily pay much more for these for the scent alone. Although both scents are incredible my favourite out of the two has to be Fleur de Figieur, its just so good! These Roger and Gallet Hand Balms are available at Escentual and Feel Unique for £6 each.